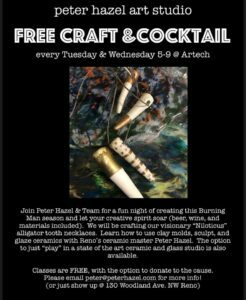 Join Peter Hazel and his team for a fun night of creating this Burning Man season and let your creative spirit soar (beer, wine, and materials included). We will be crafting our visionary “Niloticus” alligator tooth necklaces. Learn how to use clay molds, sculpt, and glaze ceramics with Reno’s ceramic master Peter Hazel. The option to just “play” in a state of the art ceramic and glass studio is also available. Classes are FREE, with an option to donate to the cause. Please email peter@peterhazel.com for more info! Or just show up to 130 Woodland Avenue, Reno, NV 89523.